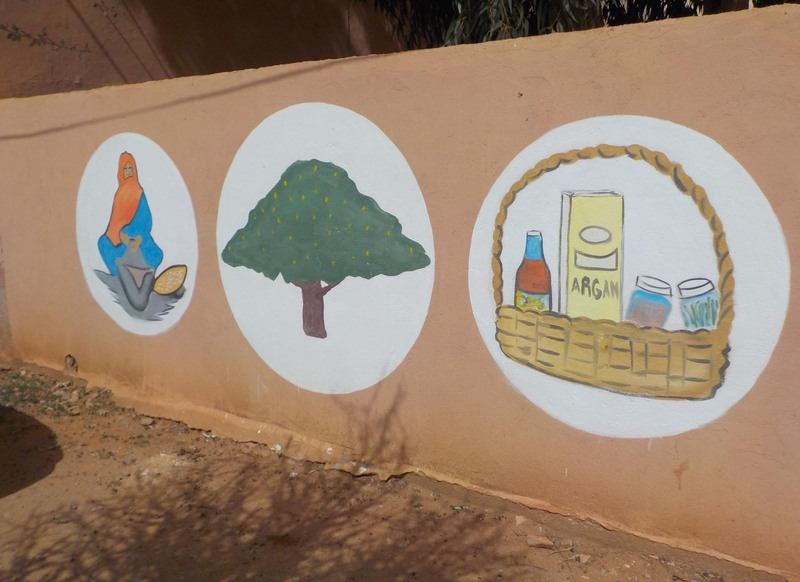 About a half hour outside Sidi Ifni on the road to Guelmime is the town of Mesti, where the Tafyoucht cooperative of women produces argan oil. 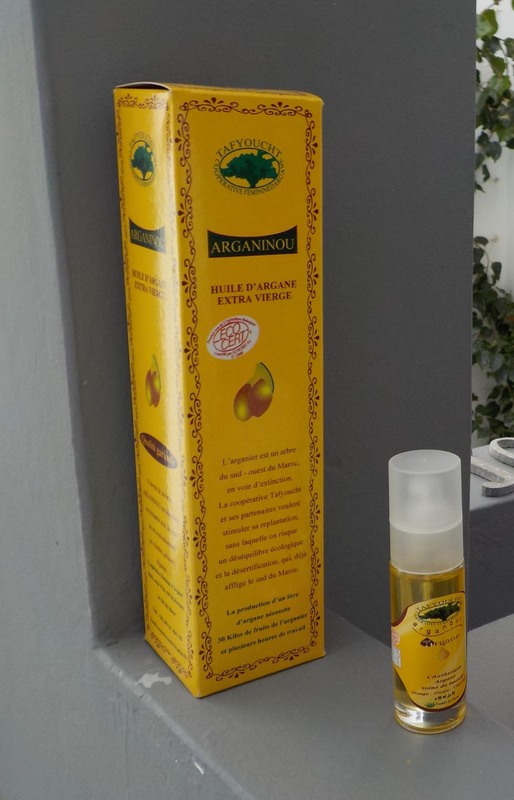 Argan trees are only found in Morocco, and the oil pressed from the nuts can be eaten or used on the skin and in cosmetics. We sat with the women cracking the nuts and found how difficult it is. It was much easier to hit my finger than the nut. I have read that an automated method of removing the nuts has not been developed and so they are all cracked by hand (! )–mostly by women like ones we sat with. We chatted with a young woman near us, so deft she could crack the tiny nuts from the shells while chatting. She was abandoned by her husband while she was still pregnant. Her daughter is now five years old. Both she and her mother work at the cooperative. The process is lengthy, but nothing is wasted. The outer husk of the argan nut can be removed mechanically and is used as animal fodder. 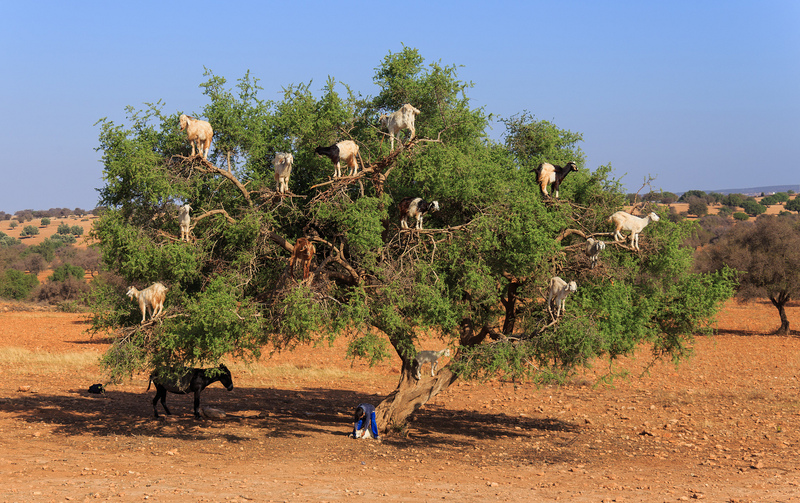 A classic photo from Morocco is a herd of goats climbing in argan trees and eating the nuts. (I did not take this one, I’m still looking for my tree of goats.) The nuts can still be cracked and squeezed for oil after they’ve been through the digestive tract of a goat, so fallen nuts are collected as well as those still on the trees. The hard inner shell that is removed by the women is used as fuel in the community bread oven. The raw nuts are pressed for cosmetics, or toasted and then cold pressed for edible oil. The slide show below shows the process at Tafyoucht. We were present on a lively day at the cooperative. Not only was there another group of visitors, but there was a film crew from BBC Arabic. The presenter asked whether he could interview Joyce as a resident of the area to ask her about the cooperative and its work and value to the community. It was fun to watch. We purchased some skin oil and some cooking oil. We did not buy, but tasted, amlouze, a blend of argan oil, ground almonds and sugar. It would be good on toast. 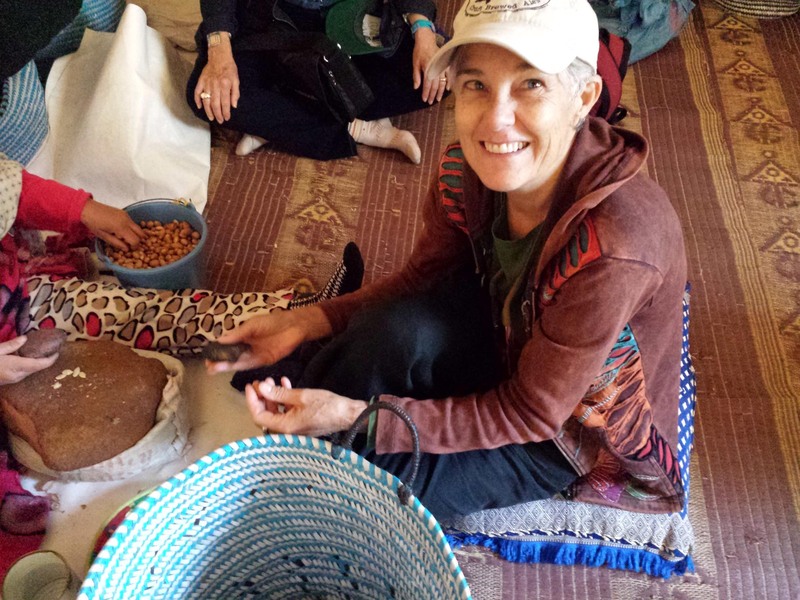 When you plan your visit to southern Morocco, the Tafyoucht cooperative is a great place to visit. Great post. Have no idea how you find the time. I will suggest your blog to all Sidi Ifni visitors.